The Modern Marco Polo Experience Program is swinging at full speed, and it’s now down to five finalists contending for the title of Modern Marco Polo. Other ardent explorers need not despair, for the Hangzhou Tourism Commission, in collaboration with Travelport, is now offering winners of interactive campaign Marco Polo’s Oriental Journey a free trip to Hangzhou. 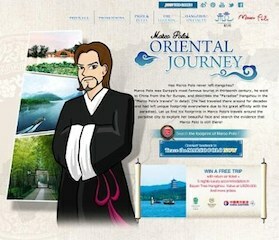 Marco Polo’s Oriental Journey’s online game Trace the Marco Polo takes gamers to relive Marco Polo’s exciting expedition to Hangzhou, declared by the explorer to be “the most charming and splendid city on Earth” when he visited 800 years ago. From now until June 30, 2014, simply sign in with Facebook on marcopolo.gotohz.com to enter a five-stage test of velocity and vision. The mission is to locate the elusive footprints of Marco Polo with a magnifying glass within the shortest time possible. The five stages will take gamers to the city’s top iconic sights, including the ancient Beijing-Hangzhou Grand Canal, UNESCO World Heritage site West Lake, the Leifeng Pagoda, the Xixi Wetland, and the Lingyin Temple. A special tip for gamers eager to win is to click on “The Legends” and “Hangzhou Specialty” to read about the folklore and distinctive features of the local community. This will reduce their total time count by 2 seconds. However, be wary of the mysterious footprints that pop into the magnifying glass – some may increase the total time count! The winner will receive an economy return ticket to Shanghai (an hour’s train ride from Hangzhou) and five nights of luxury stay at the Banyan Tree Hangzhou hotel, worth USD 6,000. A Top Referral Winner who introduces the most friends to the game will also win one economy return ticket to Shanghai plus five nights of luxury star at the Sheraton Hangzhou Wetland Park Resort, worth USD 3,800. As part of the Marco Polo’s Oriental Journey interactive campaign, Travelport is promoting discounted airplane tickets, hotel offers, and other travel privileges. One special tour offered on the website retraces Marco Polo’s original route from China’s windy northwest to fertile lands of the southeast. Hangzhou is the most Googled destination in China, and was recently ranked as the fourth top destination inChina by TripAdvisor’s 2014 Travelers’ Choice. Hangzhou received over 3 million visitors in the past year with a tourism boost of 18.5% during the 2014 Chinese New Year holiday.